A fascinating, ground breaking, must read wake-up call for all professionals and aficionados of the luxury goods industry, the consumers of their products and the celebrities that endorse them. The report says ‘Consumers’ increasing concerns with environmental and social problems are the greatest cultural shift of the 21st century’ and points the way to how these industries must behave if they are to keep their cachet which they need to survive. Dr. Jem Bendell, an award-winning authority on business-society relations, along with Anthony Kleanthous, Senior Policy Advisor on Sustainable Business and Economics at WWF-UK, together performed a study for the World Wildlife Fund United Kingdom (WWF-UK) called Deeper Luxury: Quality and Style when the World Matters, which was widely acknowledged to have inspired the luxury industry to increase efforts on social, environmental and ethical performance. 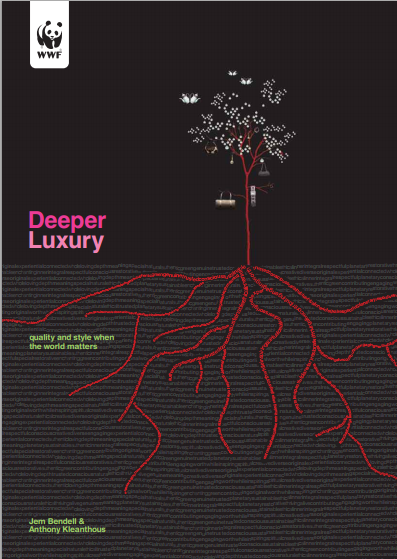 The comprehensive study provides a vision and rational for a more sustainable luxury industry through a compelling business plan for a new type of luxury with deeper values presented in smarter methods of sourcing, manufacture, marketing, and distribution. The report presents a new luxury consumer, a new luxury marketplace (featuring industry challenges), the environmental and social performance of the ten largest, publicaly-traded luxury brand owning companies, and the important role of celebrity endorsements influencing consumers and therefore companies. A lot of what is mentioned in Deeper Luxury is also re-touched upon in the later study Uplifting the Earth, also co-authored by Dr. Jem Bendell. The report also features seven companies which illustrate the future of luxury by excelling in key aspects of their social and environmental performances -Osklen, OSISU, John Hardy, Madara, Linda Loudermilk, Tesla, and Mata de Sesimbra: One Planet Living. This analytical report relates to jewelry, as it is a large division of the luxury market. What I really got out of reading the report was an initiative to shift the luxury paradigm. Luxury brands and items generate unnecessary consumption and promote a deeper division with the poorer members of society. It is true that some forms of luxury waste resources and exploit people. 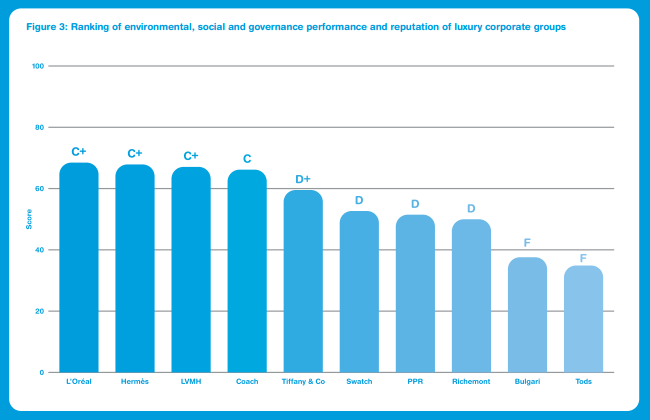 The report emphasizes the need for the luxury industry to embrace the sustainability agenda in order to produce a deeper, more rewarding experience consumers have with products. The credibility of luxury products and services should be derived from their ability to generate well-being, rather well-having with associations of power, wealth, and an overall meaningless and shallow forms of ownership. I felt the this quote by Stuart Walker, a professor of design, connected well with the concept of well-having to well-being. … an object can become the culmination, physical manifestation and symbol of good works – in its intention, design making, use and disposal … Beauty can be captured in the object through what it represents and not simply through its appearance.